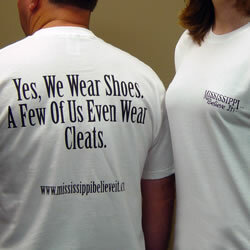 Yes, We Wear Shoes ... - Mississippi Believe It! From our teeth to our feet. Those outside Mississippi often question us from head to toe. We’ve all heard, “Do y’all wear shoes?” Well, here’s a sporty comeback: “Heck yeah, we wear shoes. Some of us even wear cleats!” Then go on to list some of our famous football players, like Brett Favre, Jerry Rice, Walter Payton, Steve McNair, Deuce McAllister, Archie Manning … Try to list as many as you can. You wouldn’t want to step on anyone’s toes!